Ryan's Smashing Life: RSL Recommends: Band of Skulls - Boston show Saturday! RSL Recommends: Band of Skulls - Boston show Saturday! Play a dirt-cheap show this Saturday! - About a week after we announced our Best-of New Albums list for Early '09, a band who got their start in London known as Band of Skulls came into my life. Without undue fanfare, let's just say this red-hot rock trio (who, as luck would have it, appear in Boston Saturday) have been a staple of my current playlist. Band of Skulls are Russell Marsden (guitar & vocals), Emma Richardson (bass & vocals), and Matt Hayward (drums). 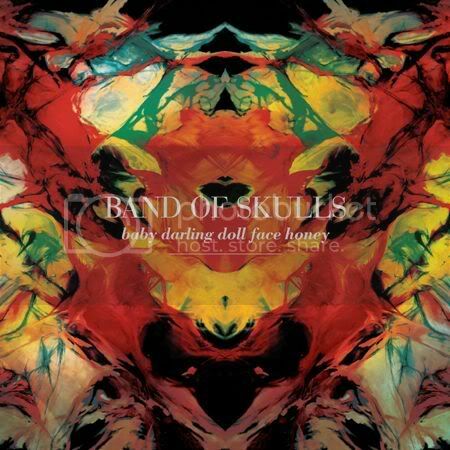 You better bet that their debut album, Baby Darling Doll Face Honey, will be on our extended best of list in three months. I encourage you to check out our writer Nik's dead-accurate album review from this June. 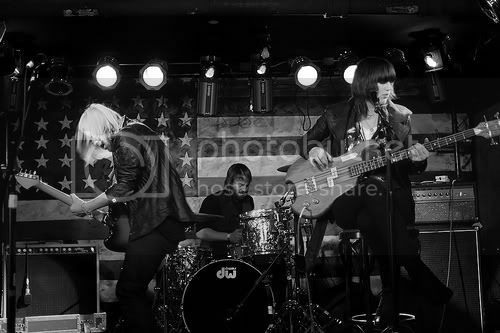 FUN FACTS with BAND OF SKULLS - Band of Skulls were previously known as Fleeing New York. They were discovered while working on new demos in late November 2008 at Courtyard Studios in Oxfordshire, UK. All of the Band of Skulls artwork (including the album cover) have been based on paintings by bass player and co-vocalist Emma. Emma recently held an art exhibition called "Meat Me At The Butchers", in a butcher's shop where she worked at weekends. Emma has a record collection of over 20,000 albums and singles. Emma was also an British sport swimming champion with medals to prove it. Band of Skulls drummer Matt has played tennis with John McEnroe. Matt's Dad was in a band who supported the Rolling Stones and had the same manager as the Troggs. Guitarist/co-vocalist Russell's great great grandfather was a stowaway on the Titanic. (He was fleeing Southampton and leaving behind three wives and 16 illegitimate children!) The man also survived a near fatal car crash that was started by weaving to the rhythm of Ace of Spades by Motorhead. Russell's great grandfather also survived a fall into a glacier! Here's the Dirt-Cheap Ticket Deal: This Saturday's show at Great Scott is a 21+ night sponsored by 92.9fm here in Boston. You can buy the tickets for an unreal 92-cents while supplies last. It will be first come-first serve this weekend. I encourage you to go online and try to snag some ahead of time. (READ: You will get shut out.) You can also win a pair of tickets by entering here. ANOTHER WAY IN from RSL: Email us with "Band of Skulls Boston" in the subject line with your full name inside (again this is open to 21+ only!) contest closes Wednesday night at Midnight. We will pick a couple of winners - each will get a pair of tickets. Great band. Wish I could be there for the show. my friends http://themean.net opened up for them on monday at mercury lounge. i knew the name band of skulls sounded familiar. kinda wish i stuck around for them.